When you’re considering your next sedan, and you’re in the market for something with style, but also a strong performance, you may want to consider checking out the 2018 BMW 530i. This luxury sedan offers a great deal inside and out, but if you’re looking to get a little more insight, you’ve come to the right place. At BMW of Westchester, we’re here to give drivers in the Westchester County, White Plains, and New Rochelle areas a closer look at the 2018 BMW 530i. This review will focus on this sedan and several of its features and components. We’ll focus on the technology and entertainment, the interior space and style, and of course, the power and performance. This 2018 BMW 530i review will give you the information that you need to know to decide if this is the right luxury sedan for you. The BMW 530i comes equipped with the 12-speaker HiFi sound system to deliver crisp and clear audio entertainment from the CD/MP3 player or the HD Radio™. You can use the iDrive 6.0 touchscreen to access your media options to play through the vehicle’s speakers. The BMW 530i also comes with pre-wiring for SiriusXM® Satellite Radio that you can include if you have a subscription. This sedan also comes with the BMW Navigation system that uses a 10.2-inch screen to display 3D maps of your location. This system even features 20GB of storage for audio files that you can bring along on the road. The vehicle also includes the Bluetooth® Mobile Office features, which displays your incoming texts to the vehicle’s touchscreen. The BMW 530i interior offers an alluring style with its SensaTec seating appointments. This synthetic leather offers a great deal of comfort and it’s easily cleaned. The vehicle’s interior has a noticeable sophistication with its Fineline Ridge Wood trim throughout the cabin. The driver’s seat features a 16-way power adjuster, and a memory system. This system lets you preset your preferred seating and mirror positions so it’s not a hassle to find your sweet spot whenever you trade off driving. One of the most impressive aspects of the 2018 BMW 530i is its exceptional performance. The vehicle is outfitted with a 2.0L 4-cylinder BMW TwinPower Turbo engine that’s fixed with an 8-speed Sport Automatic Transmission that features a variety of driving modes to enhance performance, comfortability, and efficiency. The Active Kidney Grille provides the necessary airflow to help the engine remain at an optimal temperature during peak performance. As for the actual abilities of the engine, it can deliver 248 horsepower and 258 lb-ft of torque. It only takes six seconds for the BMW 530i to get from 0 MPH to 60 MPH. 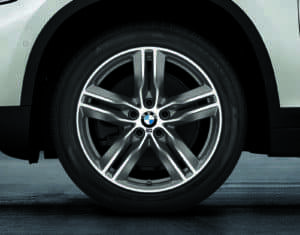 When on the track, it can deliver 130 MPG, or 155 when equipped with performance tires. At BMW of Westchester, we’re happy to provide drivers with detailed information to help them learn more. We hope that our 2018 BMW 530i review helped you see this luxury sedan’s impressive assortment of features. But if you’re looking for more information, why not drop by and give this vehicle a closer look? You can certainly learn a lot by taking the vehicle out for a spin. Schedule your test drive at BMW of Westchester today. We’re proud to give drivers in the Westchester County, White Plains, and New Rochelle areas the necessary experience to make their decision as easy as possible.